What Is The Basis Or Mechanism That Would Allow Evolutionism's Claims To Work? If you have not read Stories Versus Truth, you may want to read that before reading this. 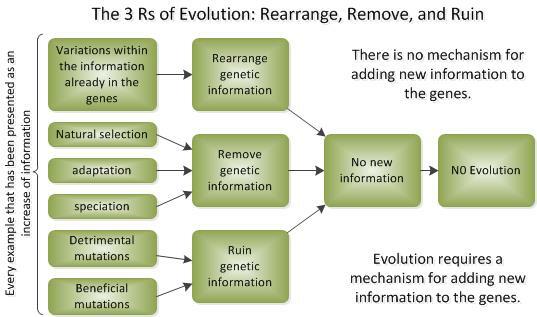 The Mechanism for Evolution--How Does It Supposedly Work? When you turn on a light, do you suppose it's magic that makes the light bulb glow, or do you think there is some sort of mechanism that makes the light go on. There is a mechanism. Everything has a mechanism, and if evolution were a valid theory, then it would also have a mechanism. Keep in mind that even if Evolution were possible, which it is not from what we know if the natural world, that would not prove that it happened. It would just be a second story competing with what God says. But this Evolution story doesn't even work. Each cell has a lot of information in the DNA. Each DNA is like a library full of documents. We don't yet know how large this library is, but we know that it's huge. All the information is there about every detail about how to reproduce. It has the exact detail about every organ. It has the detailed information about every body part. It has this information, not only for you, but for your two parents, your four grand parents, your eight great grandparents, and perhaps your 16 great great grandparents. That is a lot of information. No one knows how all these body parts work, but your DNA, in every cell in your body, knows how they work. We know a little bit about how this information is selected to be used. We know a little bit about natural selection. Natural selection chooses from the information that is already stored in this wonderful computer that exists in every cell, a computer that far exceeds anything that the human mind has ever tried to dream up. Natural Selection can only eliminate, however. It may explain a small part of the survival of the fittest, but the problem that Evolutionists choose to ignore is that they don't even have a feasible story for the arrival of the fittest. They misdirect to try to fool people into thinking that they don't have this problem, but they know that they have no answer to questions regarding the source of information that is supposedly added to the cells. Information is not added. God designed and created this information into the cells and all the evidence shows us that that information is degrading at an alarming rate. Here is your challenge if you want to be an evolutionist. No one has ever done this, so this would be quite a feather in your hat. Explain how information could be added to this library. You may quickly realize that you won't be able to, and that you'll have to just be satisfied to create a smoke screen to keep people from seeing this obvious hole in your theory. (Read the latest science on the subject: Without Excuse by Werner Gitt, a description of the scientific Laws of Universal Information. See also: Information Theory Part 1, Part 2, Part 3, Part 4. Here is another interesting article.) More is constantly being learned about information and about the Second Law of Thermodynamics. Evolutionists tend to hide in the weeds of the unknown with an argument from ignorance: "If you can't prove, by empirical science, that evolution is impossible, then it happened." By empirical science alone, we can only prove probabilities. The probabilities show the Big-Bang-Billions-of-Years-No-Flood-Molecules-to-Man story to be a bazaar hypothesis, a story that is so improbable that it should not be considered. However, empirical science is not a tool that can prove anything to be true or false absolutely. For absolute proof, we have revelation. (See Basic and Concise Guide to Practical, Useful Logic and Reasoning). God says that He created everything. He is the One Who enforces the laws of nature. He is the One Who will judge all of us in the end. We know that because we know Him presonally through the indwelling Presence of Jesus Christ and the moment-by-moment instruction of the Holy Spirit. Someone already thought of the idea of random cosmic rays coming in and hitting this DNA computer program every once in a while. They come in there like a blind man with a gun shooting at a beautiful manuscript. Each time a bullet comes whizzing in, it knocks a letter or two into a new positions. Pow! Pow! Pow! So these random shots fix things right up, maybe not every time, but sometimes. They may even cause some information to appear twice. Do you think that might be true? If you do, you don't know much about the second law of thermodynamics and you don't know much about information theory. If you think there may be some exceptions to the second law of thermodynamics, then there is a bridge that I would like to sell you. The cosmic ray idea is about as likely as someone shooting a gun at you and having wonderful results. Bullets don't fix things. The wishful thinking Humanistic pseudo-scientists have run all the experiments. You wouldn't believe the amount of free government money spent trying to make the evolutionistic paradigm work at some level in some organism, money wasted by those who would impose the religious beliefs on Humanism on everyone else. Random events always lead to a net lower level of organization and information. That "random events" story doesn't cut it. So how do you add information? How do you organize it better? The Evolutionists will tell you a half truth about the Second Law of Thermodynamics. The Evolutionists will tell the half truth: "The Second Law of Thermodynamics only applies to isolated systems, so it's not relevant to evolution, because the Earth is an open system." This is a clever lie. Here is the part of the truth that they are withholding: the Second Law of Thermodynamics was derived using theoretical isolated systems, but it applies to all systems, and can only be overcome locally and temporarily in open systems when stringent conditions are met. Not only that, but we are not talking about the Earth. The Earth is just a subsystem of a much larger system called the Universe. The Universe is an isolated system. Evolutionists claim that Evolution took place in this isolated system, but the Second Law of Thermodynamics tells us that their story is a myth. If you're going to be an evolutionist, one of the problems that you have to face is that every bit of scientific evidence points to an almighty, all-wise God who made you and me and everything you see. In fact, it's so obvious that He says that you are without excuse. Romans 1:19 Because that which may be known of God is manifest in them; for God has showed it to them. 1:20 For the invisible things of him from the creation of the world are clearly seen, being understood by the things that are made, even his eternal power and Godhead; so that they are without excuse: You see? You know because God has showed it to you and to all of us. There is no evidence at all for things going to higher levels of information and organization. Every single test has shown that random events lead to downward changes. What is the foundation, the basis, of evolution? Creation Science is based on observation and logic. This observation and logic does not place the artificial restraints of presupposed assumptions. It does not presuppose that there is no God, was no flood, was no creation, are no miracles, etc. It just sticks with observation and sound logic and, from that shows that creation is obvious. Evolutionism is based on observation and sound logic and rationalized speculation and presupposed assumptions. Evolutionism presupposes that there is no God, there was no flood, there was no creation, and there are no miracles. When observation conflicts with presupposition or speculation, evolutionists ignore observation. Evolutionists have the ability to move smoothly from observation and logic to presupposition and speculation without even realizing they are doing so. Though they never talk about it, evolution mentality also requires an underlying invalid assumption. The evolutionists assume that rationalized speculation is reasonable, which it is not. Made up stories and fairy tales are not reasonable no matter how they are rationalized. The assumptions of materialism, naturalism, and uniformitarianism are still assumptions, and so, they are arbitrary. This is true no matter how carefully they are rationalized. Since they fabricated the story, generations of scientists have used up the excess free money that government makes readily available, feverishly trying to find some evidence to support the beautiful and creative theory that they discovered. So far, they haven't come close to finding any evidence, but each new discovery holds the possibility that perhaps they may yet be able to make some sense of the theory. Keep the dream alive! You do have to hand it to them! They are continuing to proclaim that evolution is the only possibility after spending all this money and actually digging themselves into an ever-deepening hole. This persistence in the face of utter failure does reflect a very high degree of dogmatism if not utter stupidity. Give credit where credit is due. Everything has a foundation or basis. That foundation may be solid or shaky. There was a man who built a nice house on a firm foundation. Some time later, he decided to build an addition to that house, but didn't bother to put a foundation under the addition. Pretty soon, the addition started to shift and sink into the ground. Because he had nailed the addition to the house, it was bringing the rest of the house with it. Though the addition was well built, it had no foundation, so it had to be torn down. Thoughts are like that. Suppose someone were to base their view of life on made up stories, lies, and assumptions. That would be an unstable foundation, wouldn't it? It wouldn't matter how much wonderful scientific method and logic they used from that point, because the foundation would be missing. Whatever is built without a foundation will fall. We really need to understand the foundations of these two ideas. One says that Almighty God created everything. The other says that everything created itself. The fun part is to get down to the proof of evolution. It's fun to laugh at ourselves. It's a tonic tried and true. Of course, if you are into fairy tales, there is plenty of proof of evolution. The idea of evolution is based on made up stories. If you follow those stories back to their origin, you will usually end up with a root story. That root story is a fairy tale about the human mind being able to manufacture knowledge and understanding. It is the fairy tale that says that the fabrications of the human mind are valid. There is no proof to support this, but plenty of proof to show that the human mind's fabrications are simply lies. According to pure sound logic and observation, evolution is impossible. All the complexity of creation shows the handiwork of the Creator. Sound logic and observation tell us that the Creator exists, and they tell us quite a bit about Him. And they also support the account of the Book of Genesis. How is it supposed to work? Does it make any sense at all? Depending on which definition you use, Natural Selection can be real. It works to eliminate severe mutations. Natural Selection can mean different things depending on the context in which it is used, though. Some of those contexts actually try to transform Natural Selection into molecules-to-man Evolution. They also try to confuse people into believing that small adaptations (calling this micro-evolution, which is a deceiving term.) add up to molecules-to-man Evolution. At other times, Natural Selection is written about as if it were an intelligent all-powerful god that thinks things through and does them. But Natural Selection as a description of the way that severe mutations result in the death of the mutated life form is real. It can't add information and it appears that mutation never adds any information either. No one has yet observed information being added to a cell by natural means despite many tax dollars trying to do so. Mutations lose information. Evolution has a troubling information problem. Most mutations aren't detrimental enough, however, for Natural Selection to operate. Small mutations can build up in a population over time and cause extinction. It is illegitimate to use Natural Selection to support Evolution. Natural Selection supports a young Earth and a Creator. What is the supposed mechanism that makes supposed Evolution work? Can New Information Arise in Genomes by Duplication and Mutation? There Are Several Very Clear Reasons that Evolution Presents False Dogma and These Reasons Cannot Be Refuted. How Do We Know That Evolutionary Progress Has Never Been Observed? Breeding experiments have done much to debunk the evolutionary dogma. Nothing Creates Itself -- Ever! Evolutionists Make The Sanity-defying Claim That The First Strand Of DNA Arose By Natural Selection. Has anyone ever seen proof of evolution? Who Could Even Believe Such a Thing?! No One, Really. Some People Brainwash Themselves. There Are No Examples Of Continued Overall Increases In Complexity And Information Without Intelligence. What is the new type of scientific method that has been developed especially for evolution? Questions and Answers: What is the basis for your statement that no new genetic information is produced or created? Questions and Answers: What About the Kangaroo in Australia Only? Does That Prove Evolution?